Decorate your dining room or kitchen this fall season with one of our table runners, featuring warm autumn colors, pumpkins, leaves, and more! By VHC Brands, Raghu, Primitives by Kathy, and more. Autumn Leaves Braided Jute Table Runner, by Capitol Earth Rugs. 100% natural dyed braided jute with stenciled artwork in the center. This runner measures 13 x 36 inches. Autumn Leaves Braided Jute Table Runner, by Capitol Earth Rugs. 100% natural dyed braided jute with stenciled artwork in the center. This runner measures 13 x 48 inches. 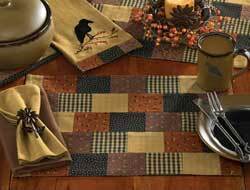 Come Gather Pumpkin Table Runner, by Capitol Earth Rugs. Features stenciled artwork of pumpkins and a border of vines, and reads "Come gather at our table." Designed by Susan Burd. Measures 13 x 36 inch. Come Sit Awhile Table Runner, by Capitol Earth Rugs. Features stenciled artwork of pumpkins and crows, with braiding in harvest colors Designed by Suzanne Pienta. Measures 13 x 48 inch. 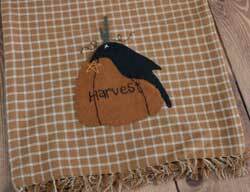 Crow and Harvest Pumpkin Table Runner, by Raghu. 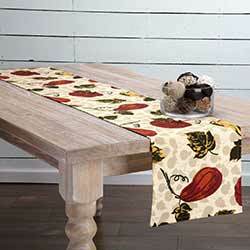 This woven cotton table runner features a tan and mustard plaid design and fringe on each end. Both ends have an embroidered and appliqued wool pumpkin and crow, and reads "harvest." Measures 14 x 36 inches. Features pumpkins and crows on each end, trimmed with folk style "tongues and pennies." 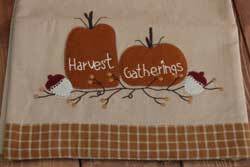 Give Thanks Felt Applique Tablerunner - so much detail in this beautiful harvest runner! Made of wool felt, with appliqued leaves, acorns, vines, and pumpkins. Embroidery reads "Give Thanks." Measures 24 inches. Good Harvest Table Runner, by Raghu. 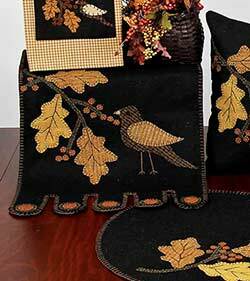 Features appliqued and embroidered leaves, berries, and bird in various wool felts in dark muted colors. Background is black, with tan blanket stitched edging. 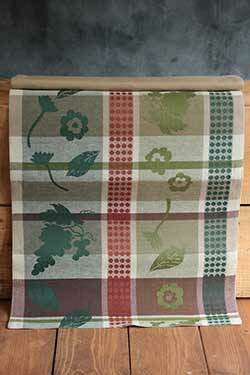 Harvest Blessings Tablerunner, by Park Designs. The Harvest Blessings Collection features homespun fabrics in a palette of tan, black, pumpkin orange, and browns. This is for the 36 inch Tablerunner. Reverses to black/tan check. Measures 13 x 36 inches. 100% cotton. Other pieces also available! Bring the garden indoors with the Harvest Garden Placemat Set! Colorful pumpkins and squashes decorate the foreground while the background features smaller silhouettes of the Harvest bounty. Harvest Gatherings Table Runner, by Raghu. This oatmeal-colored table runner is made of cotton, with a mustard plaid border. Features embroidered and appliqued designs in wool, of pumpkins, bittersweet, and acorns. Reads: Harvest Gatherings. Measures 14 x 36 inches. Jacquard weave runner in a color scheme of greens, burgundy, cordovan, beige and brown. Measures 18 x 72 inches. Harvest Pumpkin 48 inch Braided Table Runner, by Earth Rugs. A beautiful addition to your fall decor! 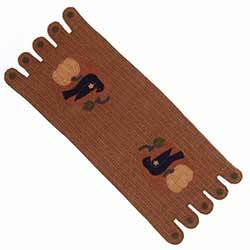 Harvest Pumpkin Oval Patch Runner, by Capitol Earth Rugs. Jute is a natural fiber, considered to be a sustainable, environmentally friendly material. Water repellant, safe to put near a fireplace, spot clean with soap and water (or dry clean). This is for the Harvest Pumpkin Oval Patch Runner, which features stenciled artwork of a pumpkin and a border of vines, designed by Susan Burd. Measures 13 x 36 inch. As with all dyed jute products, take care to use a pad or otherwise protect items used with them, as colorfastness can be an issue. Harvest Pumpkin Wicker Weave Tablerunner, by Capitol Earth Rugs. 100% runner woven into a "wicker" weave, featuring stenciled artwork. Measures approx 13 x 36 inches. Large Pumpkin Table Runner, by Raghu. This black table runner is made of wool felt, and features an appliqued pumpkin and penny edging, and decorative stitching. Measures 13 x 36 inches. 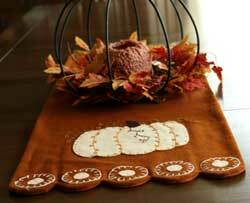 Penney Pumpkin Table Runner, by Raghu. 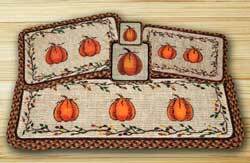 This burnt orange table runner is made of wool felt, and features an appliqued cream-colored pumpkin and penny edging, and decorative stitching. Measures 14 x 36 inches. 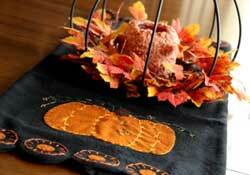 Pumpkin Plenty Table Runner, by Raghu. This oatmeal-colored table runner is made of cotton, and features embroidered designs at each end of a pumpkin and flowers. Measures 14 x 36 inches. The Great Pumpkin Table Runner, by Raghu. 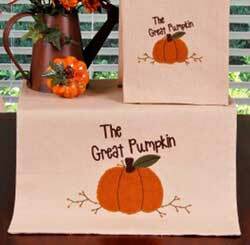 This oatmeal-colored table runner is made of cotton, and features an appliqued pumpkin and embroidery that reads: The Great Pumpkin. Measures 14 x 36 inches. 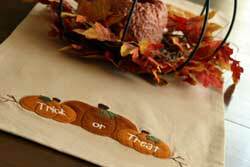 Trick or Treat Table Runner, by Raghu. This oatmeal-colored table runner is made of cotton, and features appliqued pumpkins and embroidery that reads: Trick or Treat. Measures 14 x 36 inches.